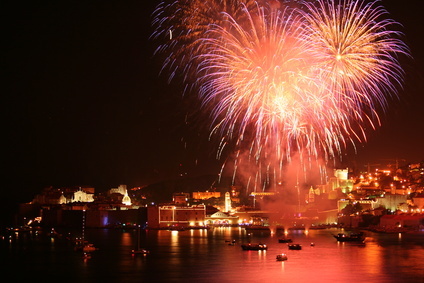 Below is a listing of the main events in Dubrovnik that take place each year. Of course, there’s many more events that take place throughout the year in this gem of a town – see the very useful listing at the Dubrovnik Tourist Board website. The 5th annual Winter Festival runs until 6th January 2019 – check local listings to see what’s on and where! Dubrovnik Festa is a mini-festival held in the run up to the Festival of St Blaise (see below). This year’s will take place from 24th January to 2nd February; events include concerts, theatre performances and food and wine offerings. As with many other towns and cities in Croatia, Dubrovnik will also be taking part in the Night of the Museum on 1st February 2019. Museums, galleries and other similar institutions open their doors to the public – for free – from 6pm to 1am. The Festival of St Blaise, who is Dubrovnik’s patron saint, takes place each year in early February (this year – 2nd to 10th February). The festival includes a number of ceremonies in which locals pay their respect to the saint; the actual saint’s day is on 3rd February. This day is also considered a “City of Dubrovnik Day”, and events are also held to celebrate this. February is also carnival month (in Croatia, and around the world). Check locally for carnival offerings in Dubrovnik. The 16th Mediterranean Fair of Healthy Food, Medicinal Herbs and Green Entrepreneurship is to be held in Dubrovnik from 14th to 17th March 2019. Tisina Molim (Quiet Please) is a film festival which will take place from 7th to 13th April 2019. Easter will be marked in Dubrovnik on 21st April 2019 – as in the whole of Croatia – with a number of events. Check out information locally to see what’s on. The sixth Dubrovnik Festiwine (22nd – 28th April 2019) celebrates wines made in Dubrovnik-Neretva county. Come and try (and enjoy!) some local tipples at a number of restaurants and wine bars in the city. The Aklapela Festival will take place from 26th to 28th April 2019 at several locations in the Old Town. The festival celebrates the traditional type of klapa (a capella) singing. Concerts are free. The folklore ensemble Lindjo perform in Dubrovnik from May throughout the summer until October (with special performances during the Summer Festival – see below.) A tradition of the city, the dance ensemble celebrated 50 years of performing in 2015. The New Europe Market is an annual TV industry conference held in Dubrovnik; this year it will be held 10th to 13th June. Ana in The City is a yearly festival involving famous Croatian cellist Ana Rucner, who you may have seen in the official Croatian tourism adverts. The festival always takes place around Midsummer’s Day, with a very early morning concert given on Mount Srd, above Dubrovnik, to welcome summer on that very day. One of Croatia’s most famous events, the Dubrovnik Summer Festival, will take place from 10th July to 25th August 2019. Each year, the Festival includes theatre, opera, music and dance events at various open-air venues around the city. Amazingly, this year is the 70th edition of the Festival. The Maraton Ladja is an annual race that takes place on a 22.5km long portion of the Neretva River from Metkovic to Ploce (both north of Dubrovnik). A ladja is a traditional type of boat that has been used for centuries on the narrow Neretva River; many of the boats used in the race are old boats that have been refurbished. Crews usually come from local towns and villages and can number up to 18 people in total, including a cox and a drummer. Dubrovnik in Late Summer is a classical musical festival that eases the town into September. This year, it will be held from 27th August to 20th September. The rather sweet sounding (in more ways than one!) International Festival of Jams & Marmalades takes place over the first weekend of October, with a variety of jam products from Croatian and neighbouring countries exhibiting. A competition to pick the best jam also takes place. The Dubrovnik Film Festival – a festival for the children and youth of Mediterranean countries – should be held in Dubrovnik in mid-October. The Good Food Festival in October (14th to 20th) offers food and drink tastings, culinary walks, workshops, kids events and more. The 16th Veteran Car Rally takes place at the end of November, with a collection of classic tours touring the local area, and being presented on Stradun. Dubrovnik now hosts a very event-filled Winter Festival which starts at the beginning of December, stretching through into early January. The Festival includes a Christmas Fair – with traditional Christmas sweet treats and drinks, plus little trinkets on sale – carols and other fun concerts; gastro events (watch out for traditional Dalmatian Christmas dish bakalar – cod – being offered); kids’ events and events involving Santa! As part of the Winter Festival, there’s of course also New Year’s Eve celebrations, around the main thoroughfare in Dubrovnik, Stradun. Celebrations include a free live concert to see in the New Year, as well as fireworks.